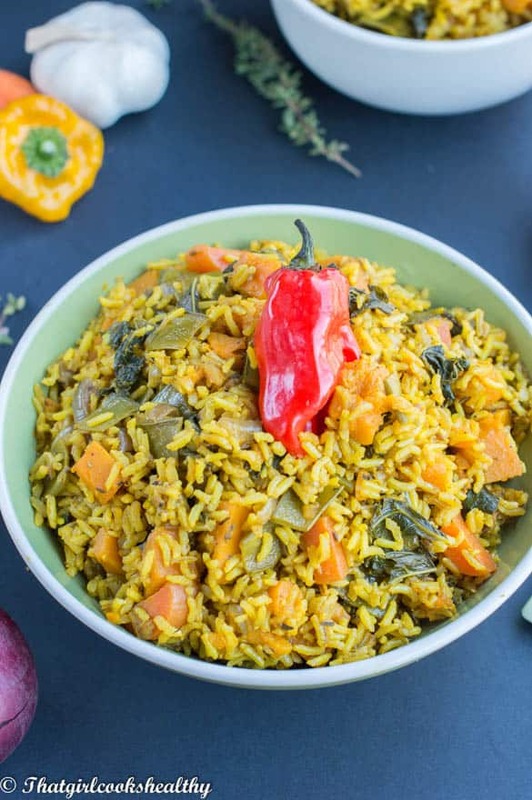 Pumpkin turmeric rice – this yellow hue dish sees brown rice and pumpkin seasoned with an array of spices with homemade vegetable stock. 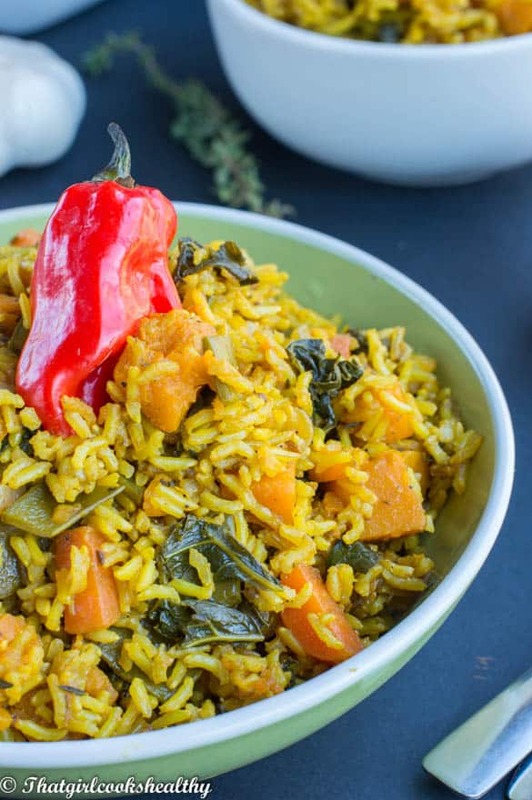 Pumpkin turmeric rice has to be hands down one of my favourite rice dishes to date. Turmeric and rice go so well together. This rice dish one is truly aromatic and well seasoned, not too hot and spicy. If you’re an advocate of a recipe that’s loaded with plenty of exotic herbs and spices then you my friend have come to the right place. As pumpkin is a seasonal vegetable you can easily substitute the pumpkin for some butternut squash instead. Most of the time I get a large quantity of pumpkin (when in season) from a family friend who is kind enough to chop it up and deliver it to my house. I also get some callaloo and other seasonal veggies from him too…..bonus! This recipe is more of a macro nutrient, carb induced recipe. Macronutrients are what the body needs in large quantities – fat, protein and carbohydrates. We need all three of those things for a number of reasons; to yield the body with energy, growth, speed up the metabolism and overall bodily function. As you can probably already tell, macro-nutrients are a vital component for the body’s sustenance, so this rice dish has a perfect balance of healthy carbohydrates. Granted I’m not a huge fan of rice anymore due to the bloatedness, but I still eat some in moderation. However, while we are on the subject, you can sprout your own rice. Sprouting rice is a effective way of ensuring the entire grain is digestive and the nutrients and enzymes which aid digestion are completely broken down and more gut friendly. How can also pre-soak the rice over night in lime juice to further breakdown the grains and completely lift the starch. 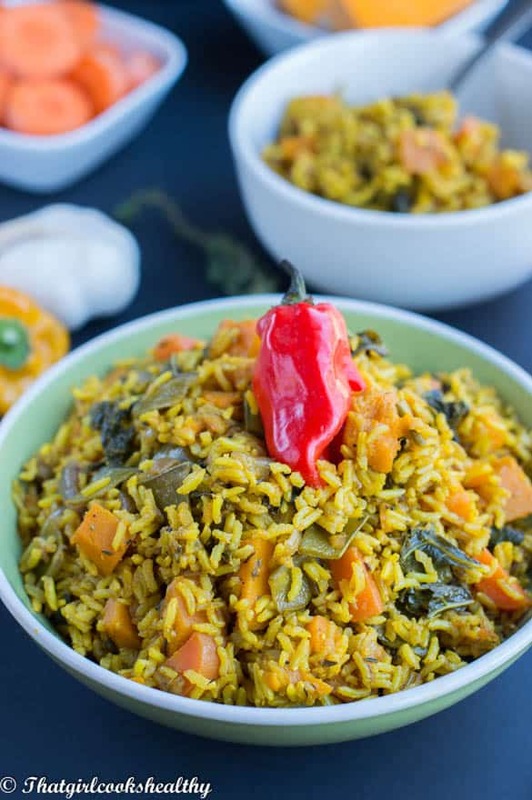 Ultimately this pumpkin turmeric rice recipe isn’t too difficult the entire cooking process is easy once the veggies are all chopped up. Pan fry the spice (cumin seeds, cloves and cinnamon) to extract their flavours, than sautee the onion and garlic for a few minutes. Then next thing you want to do is toss all of the ingredients into the frying pan and rotate, so the veggies/rice lock in the flavours – season to taste, add the stock, reduce heat and cover with lid. I do recommend using a non stick frying pan with a large circumference as it’s easier to control and manipulate he pan and keep a watchful eye as the rice absorbs the moisture, so it doesn’t burn or stick. 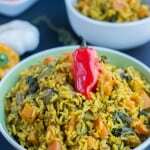 What serve pumpkin turmeric rice with? 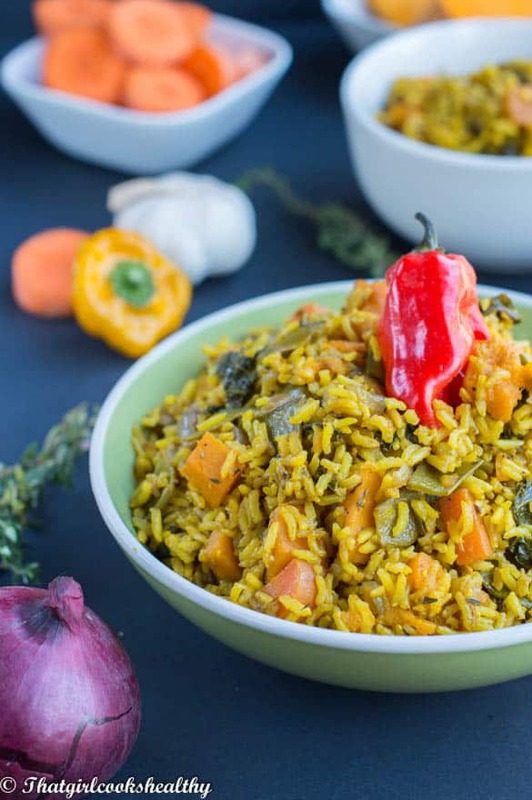 Pumpkin turmeric rice a delicious cuisine that’s fragrant gluten free and vegan friendly! Start off by gently frying the cinnamon stick, bay leaf and cumin seeds for 1 minute on medium heat. During this time the aroma will begin to release. Continue to fry then add the red onions, garlic and sautee for 2 minutes or until the onions soften and turn translucent. Add the pumpkin, carrots, spinach, sugar snaps and scotch bonnet to the pan, stir and coat the veggies with the spices. Do this for 30 seconds, you want to lock and seal in the flavour. Season with the turmeric, thyme, pepper and pink salt. Pour the vegetable stock in the frying pan, bring to the boil, then reduce the heat to low. Cover pan with the lid and allow to simmer for 40 -50 minutes. Half way through the stock level will evaporate as it is absorbed by the rice. The rice should be completely soft and fluffy when cooked, not wet or hard. If the rice is still hard after the specified time, cook for another 10 -15 minutes, checking throughout, use additional stock if required (a tbsps at a time). Charlene, me like this turmeric rice- with all the amazing spices that you incorporate in this.. what’s not to love? Thanks Imma, why not give this one a try? Aww thank you so much. Your comment means so much to me. Oh, how delicious this sounds! I love that spice mix you’ve got going there. Definitely going to try this one out! Thank you so much and let me know if you like it. This looks so tasty! Many of my friends and family members would love this recipe and many of them are gluten intolerant as well. It’s a good thing I found your site as that is what you write about! Thanks Joe, I hope your friends and family get a chance the browse my site. I’m sure they will love my recipes. This recipe looks yummy, I will try it this weekend!